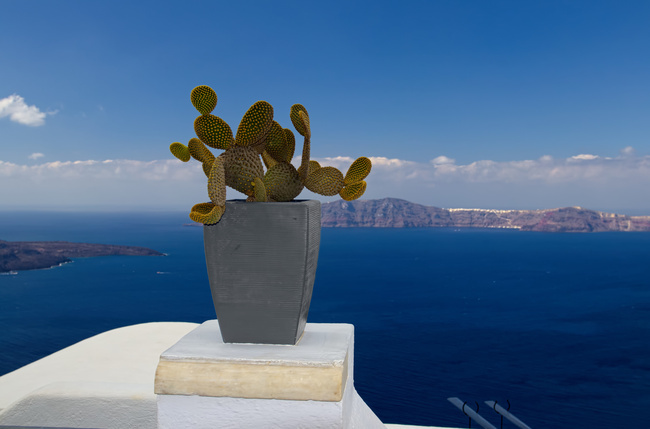 The volcanic caldera in the middle of the Santorini is the island's defining feature, forming a naturally stunning backdrop for small displays that are found along the cliff-side path. Here, a hotel has placed a potted cactus at its entrance. This variety of cactus has fruit that turns bright red when ripe, often known as a prickly pear. While the plants and fruit can be found both growing wild and in local green grocers, it is unwise to touch either with bare hands as the tiny thorns are astonishingly good at embedding themselves in unprotected skin and are challenging to remove. The fruit is quite pleasant to eat, though!